Bath time and bubbles were never so much fun! 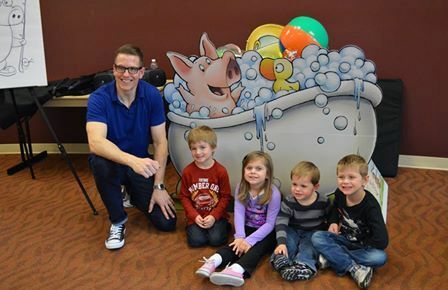 East Central Regional Library staff declare, “It was one epic, amazing, and fun event for everyone!” as Derek Anderson, author and illustrator, presented the very first, statewide Once Upon a Reader Trunk Show based on his book, Ten Pigs: An Epic Bath Adventure! The premier event held at the ECRL Branch Library in Wyoming captivated 62 kids this morning. The trunk show rolls on to Pine City this afternoon. This entry was posted in Legacy and tagged ACHF, early literacy, ECRL, Once Upon a Reader, one book, OUR, Ten Pigs. Bookmark the permalink.